And now to commemorate the release of The Legend of Tarzan, Homeworld Press is offering a special - $14.95 - 50% off the orignal book price of $29.95 and FREE SHIPPING! International orders are available for the publication price of $29.95 with FREE SHIPPING on all international orders. 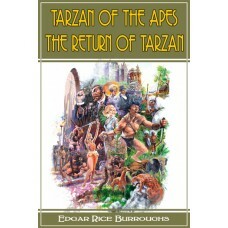 Originally priced at $29.95, this special 100th Anniversary Commemorative Edition contains the uncensored editions of both Tarzan of the Apes and The Return of Tarzan with a color book-jacket and interior artwork by DC artist Sal Amendola.